Known for its free live music almost every weekend, pool and dart leagues, and constant happy hour and game specials, The Mousetrap is a favorite downtown hangout. The classic tavern has a mixed atmosphere with people in back playing pool, darts, or foosball, others at the bar watching the game, some more in the live music nook enjoying the tunes, and a few outside on the back smoker's patio. They have 10 taps, and roughly 20 specialty beers. Open mic every Sunday. This renowned downtown Eau Claire tavern has daily sandwich and soup specials starting at 11am. Their food specials change often, but include things like chicken tacos, jambalaya, rebeuns and Irish stew, tacos carnitas, chili cheese dogs, and more. Check their website for more up-to-date menus and daily special details. Happy hour drink specials run from 4-6pm Mon-Thu, and 4-7pm on Friday. 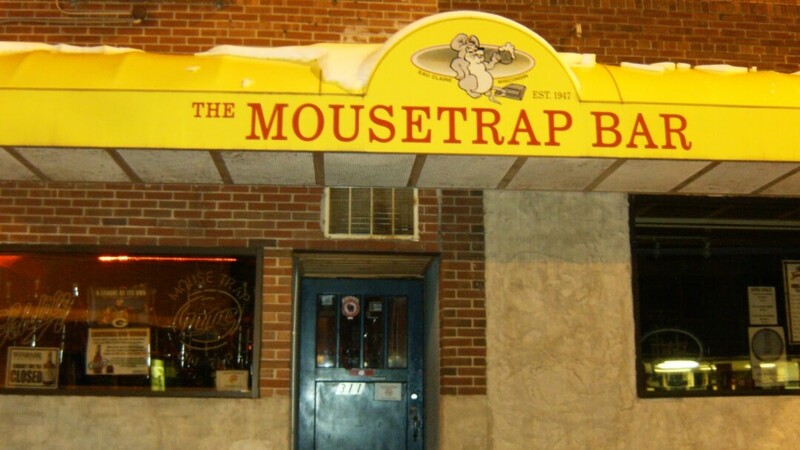 The Mousetrap. Great, great and one more...great downtown bar, my favorite. Great bartending staff and cool patrons. Don't worry about heading down there by yourself, you will find an interesting person to talk too. Live music, open mic, drink specials, darts and pool... its just overall a great bar to hang out at.